The Cabinet decided to recruit 1063 constables in Police department on regular basis through direct recruitment to ensure better law and order situation in the State out which 213 will be women constable. It gave approval to fill up 200 posts of MBBS doctors on contract basis through walk-in-interview in Health and Family Welfare department to cope with the shortage of doctors in remote and far flung areas of the State. The Jai Ram Cabinet approved filling up of 20 posts of different categories of non-teaching staff in Dr. Y.S. Parmar Horticulture and Forestry University, Nauni in Solan district and 64 posts of Horticulture Extension Officers in Horticulture department on contract basis to strengthen the horticulture activities in the State. It was decided to fill up 14 posts of subject matter specialist and one post of Assistant Professor Veterinary Gynaecology and Obstetrics in Chaudhary Sarvan Kumar Himachal Pradesh Agriculture University, Palampur on contract basis. The Cabinet agreed to create and fill up different posts in the office of Vice Chairperson, Saksham Guriya Board for its smooth and effective functioning. It also gave its consent to fill up one post each of Assistant Professor in Cardiology and Urology department of IGMC, Shimla through direct recruitment on regular basis. 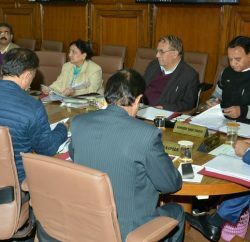 The state cabinet also accorded its approval to create 10 posts of Junior Office Assistant in Ayurveda Department on contract basis besides filling up 8 posts of Clerks through limited direct recruitment in the department. The approval was accorded to increase the incentive amount of MBBS doctors appointed or to be appointed on contract basis by Rs. 10,000 per month and that of specialist doctors by Rs. 15000 per month to encourage doctors to serve in tribal, remote and far flung areas of the State. 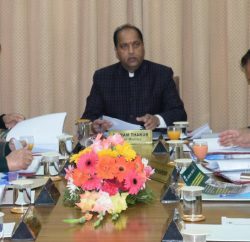 The Cabinet gave its nod to fill up vacant posts of part time water carriers on compassionate ground, provided the candidates are below the poverty line or has a low income certificate issued by competent authority, widow, member of family living in extreme indigent conditions, women deserted by her husband, handicapped person or an orphan. It gave nod to fill up four posts of Himachal Pradesh Administrative Services through direct recruitment by Himachal Pradesh Public Service Commission on regular basis. It decided to create and fill up three posts of Junior Office Assistant (IT) on contract basis and one post of clerk through limited direct recruitment in HP Staff Selection Commission, Hamirpur. It gave consent to create five posts of different categories in newly opened office of Sub Divisional Soil Conservation officer at Bagsaid in Mandi district. The Cabinet gave its approval to create IT Cell in Irrigation and Public Health Department along with creation and filling up of six posts of different categories. The Cabinet approved to fill up three posts of steno typists in Home Guards and Civil Defence department through direct recruitment. The Cabinet gave its approval to fill up 17 posts of various categories in Geological Wing of Industries Department to check illegal mining in the State. The Cabinet gave its nod to adopt new e-stamping scheme for non-judicial stamp papers to facilitate the people to procure stamp paper online and they would not need to go to treasury and banks for the stamp. 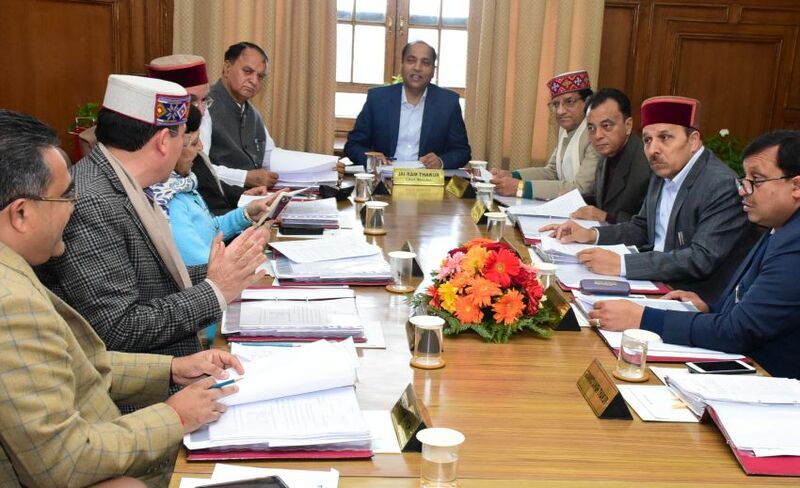 The State Cabinet in its meeting held here today under the Chairmanship of Chief Minister Jai Ram Thakur decided to recommend the Governor of Himachal Pradesh to convene the budget session of H.P. Vidhan Sabha from 4 to 27 February, 2019.